Top 25 companies held more than three-fourths of worldwide semiconductor market. 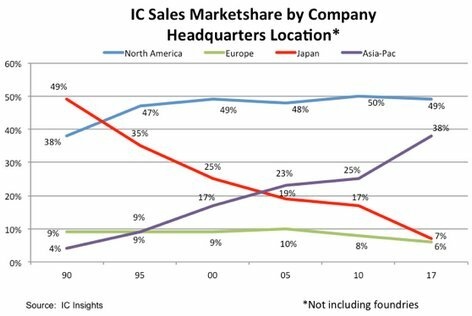 April 11, 2018 -- Research included in the April Update to the 2018 edition of IC Insights’ McClean Report shows that the world’s leading semiconductor suppliers significantly increased their marketshare over the past decade. The top-5 semiconductor suppliers accounted for 43% of the world’s semiconductor sales in 2017, an increase of 10 percentage points from 10 years earlier (Figure 1). 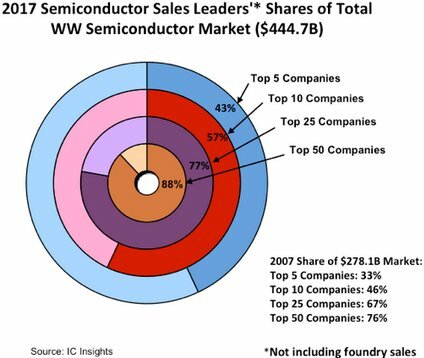 In total, the 2017 top-50 suppliers represented 88% of the total $444.7 billion worldwide semiconductor market last year, up 12 percentage points from the 76% share the top 50 companies held in 2007. Additional details on sales rankings for the top 50 semiconductor, top 50 IC, and leading IC foundry rankings are provided in the April Update to The McClean Report—A Complete Analysis and Forecast of the Integrated Circuit Industry. A subscription to The McClean Report includes free monthly updates from March through November (including a 250+ page Mid-Year Update), and free access to subscriber-only webinars throughout the year. An individual user license to the 2018 edition of The McClean Report is priced at $4,290 and includes an Internet access password. A multi-user worldwide corporate license is available for $7,290. MediaTek, SK Hynix, AMD, and Micron Sales Surge in 1Q14!